Footballers, Models, Civilians: this new bar and pub is housed in the space of a former bakery, which also lends the place the name, "Balke". Essentially a re-design that mixes traditional oak wall-fittings with low-key design additions and featuring torch lamps by Sylvain Willenz. 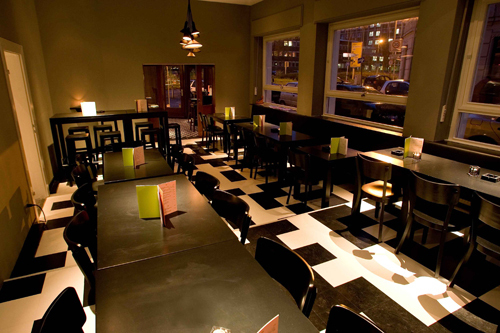 The venue takes up some clues from the previous interior, such as the chequered floor tiles of the bar room and continues this theme with a irregular Japanese QR-code like floor pattern. The exterior utilised an existing lightbox for the display of changeable two-liners, mottos, jokes or plain lies. Currently they read: "Sp?tvorstellung" (Late Night Performance) and "Tonight: Local Talents".